Clean Whiteboards In One Quick And Simple Step. 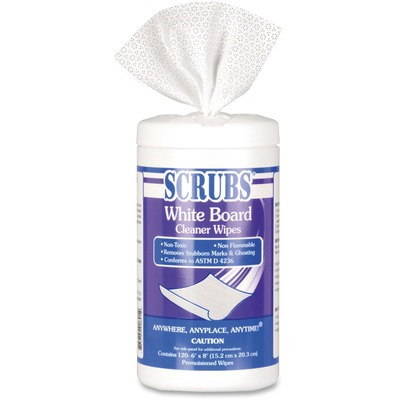 Scrubs Whiteboard Cleaner Wipes Combine A Safe Low-Alcohol Formula With A Soft Absorbent Wipe To Make Whiteboard Cleaning Quick, Easy And Convenient. Use To Restore Whiteboards By Removing Ghosting, Greases, Stubborn Marks, Stains And Shadows. Lint-Free Wipe Can Be Used As An Eraser As Well As A Cleaner. It Picks Up Marker Dust Ordinary Erasers Leave Behind. Nontoxic, Nonflammable Wipes Have A Light, Clean Scent. Convenient Design Means No More Messy, High Alcohol Sprays, Oversprays Or Indoor Air Quality. Recyclable Container Keeps Towels Moist..
Clean Whiteboards In One Quick And Simple Step. Scrubs Whiteboard Cleaner Wipes Combine A Safe Low-Alcohol Formula With A Soft Absorbent Wipe To Make Whiteboard Cleaning Quick, Easy And Convenient. Use To Restore Whiteboards By Removing Ghosting, Greases, Stubborn Marks, Stains And Shadows. Lint-Free Wipe Can Be Used As An Eraser As Well As A Cleaner. It Picks Up Marker Dust Ordinary Erasers Leave Behind. Nontoxic, Nonflammable Wipes Have A Light, Clean Scent. Convenient Design Means No More Messy, High Alcohol Sprays, Oversprays Or Indoor Air Quality. Recyclable Container Keeps Towels Moist.